Fighting has once again escalated in northern Mali’s Kidal region, with clashes between Tuareg separatists and the army reportedly killing 36 people on 16 and 17 May. Despite the failure of the 2012 rebellion in northern Mali and the loss of most of the territory they briefly laid claim to, Tuareg separatists say the fight for an independent territory of Azawad is not over. Activists from the National Movement for the Liberation of Azawad (MNLA) now living as refugees in neighbouring Burkina Faso say their original demands still stand. At 25, Alassane Mohamed Acheikh stands out among Tuareg refugees living in the refugee camp at Mentao in northern Burkina Faso. Articulate and passionate, he quickly dominates a meeting of camp residents aimed at relaying refugee concerns to the outside world. But he speaks both as a refugee and a self-proclaimed activist for the MNLA, hurriedly correcting himself when he refers to “northern Mali”, instead of Azawad. Interviewed in private, Acheikh talks of growing up hearing stories from the rebellion of 1963, registering the brutal reprisals that came as the Malian army’s counter-insurgency campaign tried to wipe out resistance in the north. “You will find adults here in these camps who were orphaned by that conflict,” Acheikh points out. 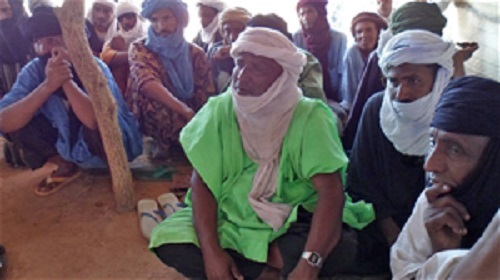 From his point of view, the MNLA decision to stage an insurgency in January 2012 was fully justified by both past events and the continuing discrimination of Tuareg communities. “The international community needed to know what was going on,” Acheikh argues. “There had been so many fake agreements, so many documents left neglected in office drawers. The rebellion ensured the world paid attention. From an older generation, Zouda Ag Doho, 52, a teacher from Gao, and another MNLA sympathizer and refugee in Burkina Faso, talks heatedly of past atrocities, including summary executions and mass rapes, and a succession of broken promises. Ag Doho, was recently named president of the refugees in the camp at Sag-Nioniogo camp, outside the capital Ouagadougou. He says discussions on separatism, autonomy, or a new confederal arrangement for Mali should not be outlawed, arguing that it is the relatively new government in Bamako which has yet to offer any ideas for the future of the north and is in danger of repeating all the mistakes of the past. “We are again into a cycle of rebellion and reprisal,” warns Ag Doho. He has little hope in the government of President Ibrahim Boubacar (IBK) and its ability to find a “definitive solution”. He warns of past initiatives where development funds were squandered and projects were put in the hands of Malians from the south. Ag Doho talks with open contempt of the easy co-option and corruption of Tuaregs drawn to Bamako to serve as MPs, civil servants, or even ministers. Those arguments are strongly challenged in Bamako, both by the current government and by Tuaregs who have made their own accommodation with the Malian state and seen the MNLA as wrong-headed and dangerous. In a recent interview with Afrique Magazine, President Ibrahim Boubacar Keita talked of a minority holding back the peace process. Keita argued that the key to peace in northern Mali was the will of different communities to live together peacefully, stressing that the Tuaregs, like other Malians, “have the right to feel at ease in their own territory” and that the Tuaregs’ own civilisation should be considered as part of Mali’s history and identity. Ag Doho, a Christian, is adamant that part of the MNLA’s original motivation was to confront a carefully calculated infiltration of the north by mainly Algerian radical Islamists, exploiting the region’s poverty, offering lucrative opportunities in drug-trafficking and other criminal activities to a marginalized youth population. For Ag Doho, the authorities were at best indifferent, at worst directly complicit in allowing illicit networks to build up. The MNLA was ready to challenge all that, “but did not have the power”. Ag Doho talks with contempt of the role played by veteran Tuareg leader Iyad ag Ghali in creating Ansar Dine as a foil to the MNLA, forging a disastrous alliance with groups like Al-Qaeda in the Islamic Maghreb (AQIM) and the Movement for Oneness and Jihad in West Africa (MUJAO). Despite the French military intervention and the reported dispersal of Jihadist elements, Ag Doho says the movements have regrouped effectively in areas like southern Libya, and can hold out against half-hearted French-led clean-up operations. MNLA supporters say the movement has been repeatedly misrepresented as an exclusively Tuareg phenomenon, pointing to combatants, senior cadres and even political prisoners from other ethnic groups. But some other Tuareg refugees are markedly more sceptical about the MNLA’s identity and motivation. Mohamed, 39, a father of one from Gao, who recently got out of the Sag-Nioniogo camp to find accommodation in Ouagadougou, blames the rebellion for his predicament. “I never supported the rebellion or the MNLA,” Mohamed explains. “I still do not understand what they want. Never forget that there are many different groups within the Tuaregs and some are simply working for themselves”. Mohamed says he has friends who support the movement, but is scathing about the MNLA’s leadership and its indifference towards ordinary refugees. Several senior MNLA figures are based in hotels, reportedly in the up-market “new capital” district, Ouaga 2, their living conditions extremely different from those experienced by refguees in areas like Djibo and Sag-Nioniogo. “We seek them out, but they never come to us,” Mohamed complains of the MNLA. Mohamed also echoes a complaint often heard from non-Tuaregs in Bamako that there is no clear-cut distinction between Jihadist and MNLA fighters, and that alliances have been made and connections retained that completely discredit the MNLA’s cause. Mohamed Ahnou, a Tuareg from Niger living in Burkina Faso, has followed the insurgencies in Mali and Niger over many years. A recent visitor to the camp at Sag-Nioniogo, Ahnou says he was shocked by conditions and the level of degradation refugees are exposed too. He says the MNLA has yet to take on its responsibilities. For Ahnou, MNLA rhetoric about promoting inter-communal harmony ignores a much worsened climate of suspicion and division in the north. “This is what the rebellion has done.” Ahnou warns that the poison runs too deep for any peace agreement signed to carry much substance. He warns that Niger, often cited as a success story, with a better-integrated Tuareg community and a more focused administration, remains fragile, with the threat of a future breakdown not to be discounted. Ahnou warns that even the long-term future is bleak for Mali. “I can’t see the north being put back together as it was many, many years ago”.